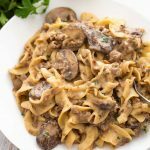 Instant Pot Hamburger Stroganoff is a delicious, money saving variation of the favorite Beef Stroganoff. With a rich flavor from simple ingredients, no ‘cream of’ soup is needed. 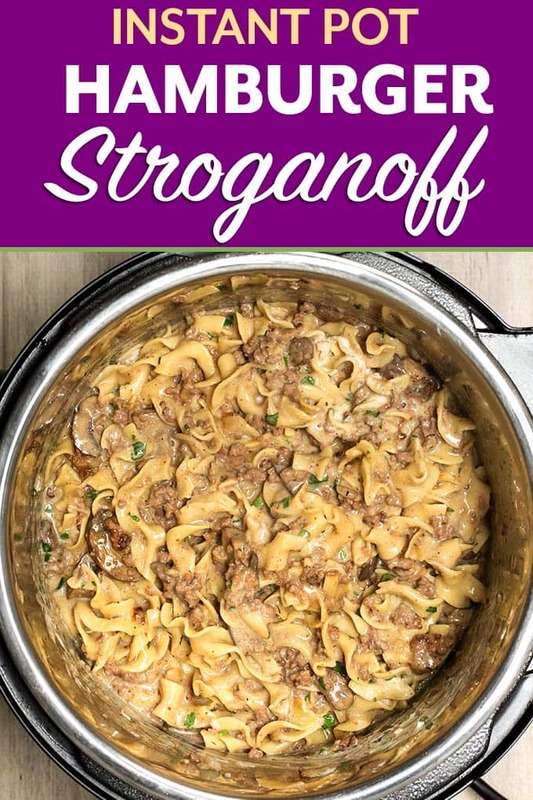 This pressure cooker ground beef stroganoff will become a family favorite! Talk about comfort food! Pasta has to be one of the top favorites for me. The creamier, the better! If I can make the meal for less money, that’s a win! 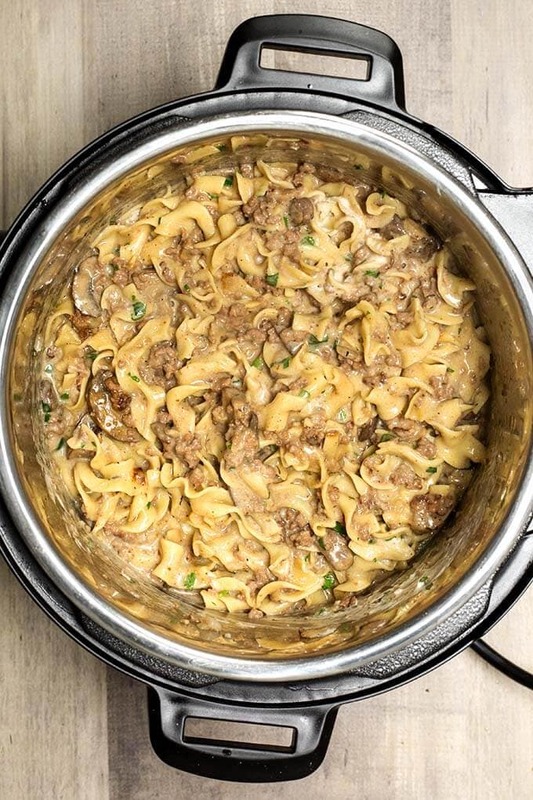 Traditional Beef Stroganoff is made with beef tenderloin. It is amazing, however, it is also pretty expensive, especially when you are making a family-sized batch. 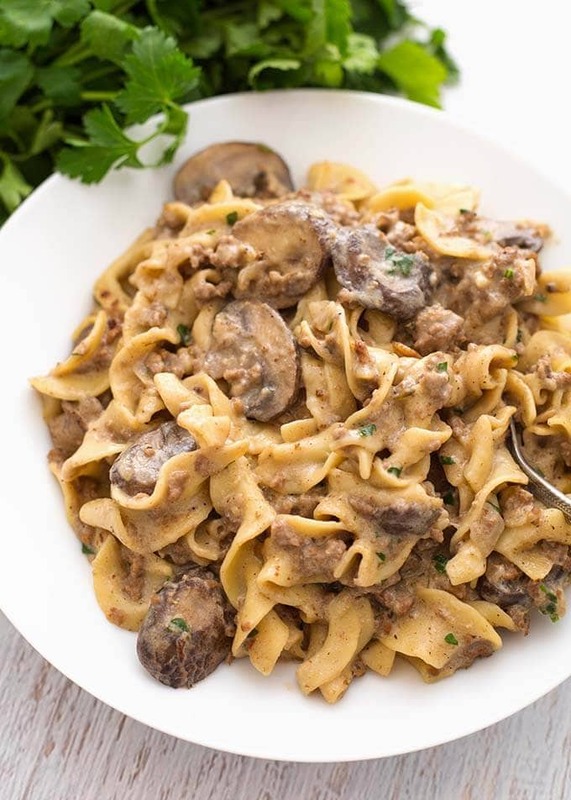 Using hamburger, ground beef, ground turkey, will save you some money, and it’s easier to make this Instant Pot Hamburger Stroganoff into a one-pot dish. The ground beef will cook up faster and easier when you give it a browning first, and then leave it in when you add the pasta. No draining! 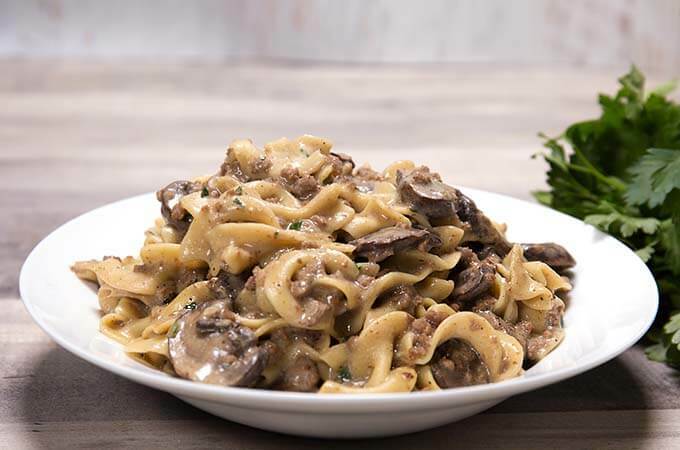 I love Beef Stroganoff made with the tenderloin, or even a Flat Iron, Ribeye, or other cut of beef. But something about this hamburger version just works! It’s especially good for little ones who maybe don’t like chewier pieces of beef. If you don’t want to use sour cream, you can substitute Greek yogurt and still get the creamy consistency and tangy flavor. I hope you give it a try! Let me know in the comments if you make this, and how you liked it! Follow me on Pinterest for all of my recipes, and other great ideas for your Instant Pot! Instant Pot Hamburger Stroganoff is a delicious, money saving variation of the favorite Beef Stroganoff. With a rich flavor, no 'cream of' soup needed, this pressure cooker stroganoff will become a family favorite! Turn on Sauté setting. When pot is hot, add the oil, butter, and onion. Cook, stirring occasionally, until just starting to turn translucent. Add the ground beef and stir, breaking up the meat, but leaving a few larger chunks. Cook, stirring occasionally, until just a little pink remains. Add the thyme, salt, pepper, garlic, and Worcestershire sauce. Stir and cook for 1 minute. Add the mushrooms and mix well. Cook for another minute. Sprinkle the flour over the mixture and stir well to combine. Pour the broth on while stirring, and scraping the bottom of the pot to get up any brown bits (deglaze). Add the egg noodles and press them gently into the mixture to submerge them as much as possible. Cancel the Sauté function. Then press the Pressure Cook/Manual button or dial, and the + or - to select 4 minutes (5 minutes for softer noodles). After the cook cycle has finished, let the pot sit undisturbed for 2 minutes. Then do a controlled Quick Release of the remaining pressure/steam, until the pin in the lid drops down. Carefully open the lid and add the parsley and sour cream. Stir gently to incorporate the ingredients. Taste and adjust salt, if needed. Serve immediately, garnishing as desired. We made this tonight and it was delicious. Only problem was that I kept getting the burn message. I took everything out, scrubbed the bottom the pot, added 1/2 cup of water and tried again, got another burn message. I followed everything to the letter in the recipe, not sure why it kept burning. After the third time, I gave up and just served it as it was, everything was cooked and tasted great, the IP just didn’t ever get to pressure. Hi Sue, that darn Burn message! Sometimes I get it, and sometimes I don’t. I would say that for the next time you make this, try adding another 1/2 cup of water/broth and see if that helps. It is also important to make sure you have the correct amount of pasta. I use a food scale and weigh it when I make these recipes, and then try to put it into cups for you. Sometimes people have to use a different variety of pasta, and that can throw the ratio off. That’s when a food scale comes in very handy. Just a thought! I’m glad you liked this recipe, despite that Burn message! Love yer idea of a food scale for no error. What brand is good ? That’s great, Patty. I’m happy to know you are having a positive experience with your Bella! Can I double this recipe? 6 cups of broth? Hi Lori, yes, you can add more broth. And noodles, if they don’t go over the 2/3 full line. i made this and it was excellent! Awesome! Thank you for your review! I have an 8 qt Instant Pot, any changes to the recipe that you recommend? Hi Samantha, maybe add 1/2 cup more beef broth. It should work fine. This was my first instant pot recipe. And it was great. A couple things. My pot has high pressure and low pressure, I used low and went for 6 minutes. I used about 3/4 cup of condensed mushroom soup, 1 cup water or so and 2 cups beef broth. The consistency was perfect. Thanks. Hi Susan, I’m glad you liked it! Thank you for your review! I really would like to make this but 8 oz of egg noodles seems too little amount, are you sure just 8 oz?? 8 oz weighed is enough. You can use more if you want. Only 8oz of egg noodles??? Made for dinner tonight. I used ground turkey and added the entire package of noodles and increased the broth to 48 oz plus 1 cup of water and held my breath. Turned out perfect! I didn’t add any salt but next time I will. Sprinkled Parmesan cheese on top. Very yummy. Thanks for the recipe! Will make again for sure! I’m glad it worked for you, Michelle! Thank you for your review! I made this recipe for dinner last night and it was a huge hit! I doubled the recipe and thank goodness I did because everyone devoured it. Thanks so much! Made this tonight and followed the recipe exactly, including weighing the noodles. Got the “burn” message. Finished it on saute and it tasted great. Next time I’ll add more broth. Sorry to hear that, Robin. I’m glad it tasted good! I agree that more broth will help. Feeding a family of 5… we made this on Tuesday and they’ve been talking about it every day since, so we are making it again today (saturday). I usually doctor things up, but this recipe is perfect as is! Only change I made is that I used Greek yogurt because I assumed I had sour cream and didn’t check… oops! So PSA, greek yogurt works too if anyone is wondering!! This recipe is on the permanent list of YES! Are you suppose to drain the fat from the ground beef after sautéing? Katie, if you use a lean ground beef you shouldn’t have to. If there is an excessive amount then yes. This is the 3rd thing I cooked in my IP. It turned out perfect and my hard to please family loved it! Thanks for the great recipe and I can’t wait to try more! That’s awesome, Amanda! I’m glad you liked it! Thanks for the review! My only complaint was that the recipe didn’t make enough, otherwise I loved it! I didn’t have fresh mushrooms on hand. I had my husband pick up some and cooked them on sauté for about two minutes after it was done with the pressure cooking. I also used thicker noodles but did weigh them on a food scale. Because my noodles were thicker (and require a longer cook time) I increased the pressure cooking time to 13 minutes. The noodles were perfect! I have an 8 qt. pot and did not get the burn message. I normally don’t write reviews but this recipe was GREAT!!! If your daughter can have egg whites, the No Yolks pasta is very good. Otherwise you will need to do a search for an egg free variety. This was amazing! It is a keeper for sure on our recipe rotation. Thanks for sharing it! That’s great, Becky! Thank you! So, quick question, I’m new to instapot, when the cook time is done, do you turn the pot off for the 2muns resting? You can, just use a clock. You don’t have to though. Made this last night and it was excellent! I have an 8 qt and I did get the dreaded burn message…but I released the pressure and checked it and it was done anyway (even though it never got up to pressure). I doubled it and it worked perfectly! The only other changes I made were to leave out the mushrooms and used more seasonings. Thank you so much! I never comment on recipe blogs but this was DELICIOUS. Adding it to our regular dinner rotation for sure! It’s only the 3rd thing I’ve ever made in my instant pot and it came out perfect. Thank you for an awesome recipe! That’s great, Angela! I’m very happy this was a success for you, especially being new to the IP! Thank you for your review! Is the purpose of the binder clip to secure the inner pot so it won’t rattle while stirring/sautéing? I am guessing that, but is there another reason? Yes, it stops the inner pot from spinning when you have a lot of stirring to do. Delicious. Thanks for the recipe. I made a few changes to encompass what I had on hand and to add more veggies and accommodate for food allergies, LOL. Used cremini and shiitake mushrooms, added carrots and celery, used cashew milk instead of sour cream and used gluten free noodles. Worked great and tasted great. has anyone used a different kind of pasta? penne or the macaroni noodles? thanks.